CAN'T SAY ENOUGH ABOUT THIS PIECE. IT IS BEAUTIFUL. I have had more people notice this necklace and told me that it was beautiful than they have on $3,000 pieces that I have worn. Halfway into our ambitious trek through the rain forest I had to remind myself that â€œNothing good comes easy.â€ These days it seems that every business trip to Brazil includes a sweltering hike through overgrown jungles, around cascading waterfalls and down steep rock cliffs. But our gem broker insisted it was worth the trouble. To tell you the truth, for the dazzling emeralds he delivered, I'd gladly go back to stomping through jaguar country. Now our good fortune is your great reward. Don't miss this rare opportunity to own an impressive 50 total carat strand of genuine South American emeralds. Faced with this embarrassment of riches, our designer transformed this spectacular cache of large stones (each is over 8 carats average weight) into a stunning 50 total carat necklace of faceted emeralds set into .925 sterling silver. 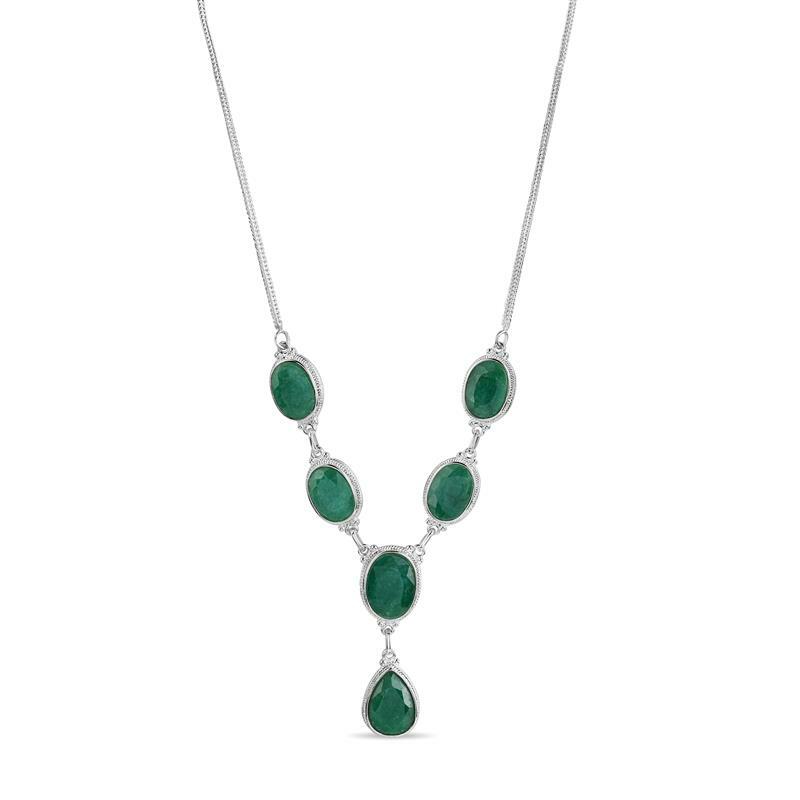 Each emerald is surrounded by delicate sterling silver rope work and filigree in the Bali-style. The 18" necklace dangles from a sterling silver chain that fastens with a secure double-sided shepherd's hook clasp. What is the source of our emerald's timeless appeal? 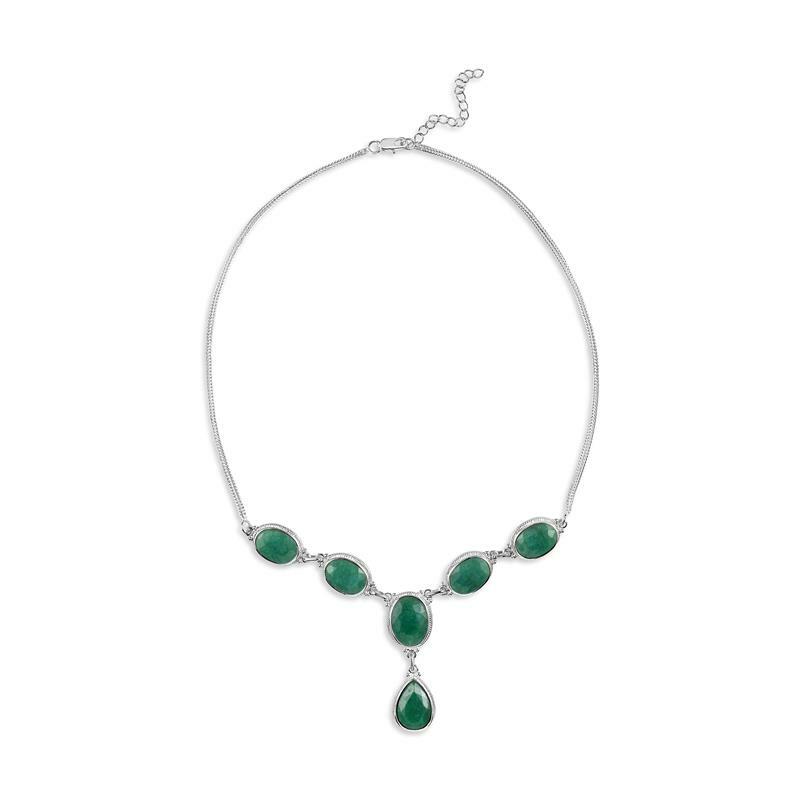 The enchanting color of the Stauer Carnaval Faceted Emerald Necklace comes from nature's chemistry. Our polished and faceted, well-formed natural emeralds are immediately recognized as something special. Indeed, when we evaluated these emeralds, color was the most important quality factor. Today, scientists tell us that the human eye is more sensitive to the color green than to any other. Perhaps that is why green is so soothing to the eye, and why the color green complements every other color in your wardrobe. Emeralds are, by weight, the most valuable gemstone in the world. Now you can wear genuine emeralds and feel great about knowing that you were able to treat yourself to precious gems without paying a precious price. A top-quality 50 carat emerald necklace found on Rodeo Drive or 5th Avenue could cost well over $100,000 but not from Stauer. 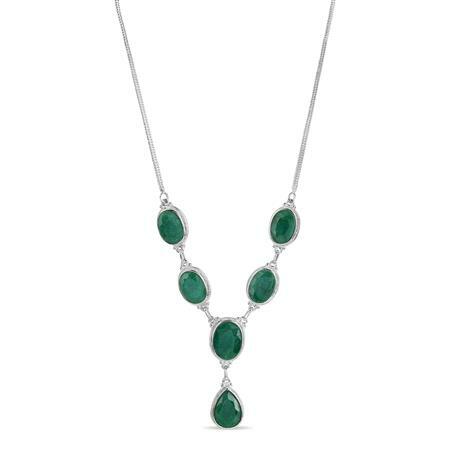 Wear and admire the exquisite Stauer Carnaval Faceted Emerald Necklace for 30 days. If for any reason you are not dancing the Samba with pure satisfaction after receiving your faceted emerald necklace, simply return it to us for a full refund of the purchase price. But we're confident that when you examine this stunning jewelry, you'll be reminded of the raw beauty of the Amazon rain forests mixed with the flash and dazzle of the exotic Carnaval in Rio de Janeiro. Order today! This cache of genuine emeralds is extremely limited.